The State Government’s urban water reform is transforming how we manage our water cycle and how water cycle services are provided in Victoria. 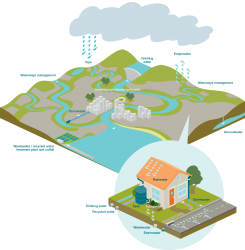 We are shifting away from predominantly centralised catchment-to-building water and wastewater systems, to a whole-of-water-cycle management approach. The required skills and knowledge base of those working within Victoria’s water sector - water corporations, local councils, developers, consultants and contractors - are also changing. The Victorian water sector is already highly skilled in traditional water management, however new skills and increased awareness and understanding are required to deliver best practice whole-of-water-cycle management. To understand the skills and knowledge gaps of those working within Victoria’s water sector, Clearwater is working with Office of Living Victoria to develop a whole-of-water-cycle management capacity building program. design of a capacity building program to meet the whole-of-water-cycle management skill gaps identified. For more information, read our project fact sheet. Stage 1 of the project provides a great opportunity for you, as an industry stakeholder, to directly let us know what you need regarding whole-of-water-cycle management and influence the future support available to you. This will ensure that a range of perspectives are canvassed on the current capacity building needs of the water industry. To register your interest in contributing to this important needs analysis, please click the button below. We will be in touch in the next couple of weeks to let you know how you can participate.